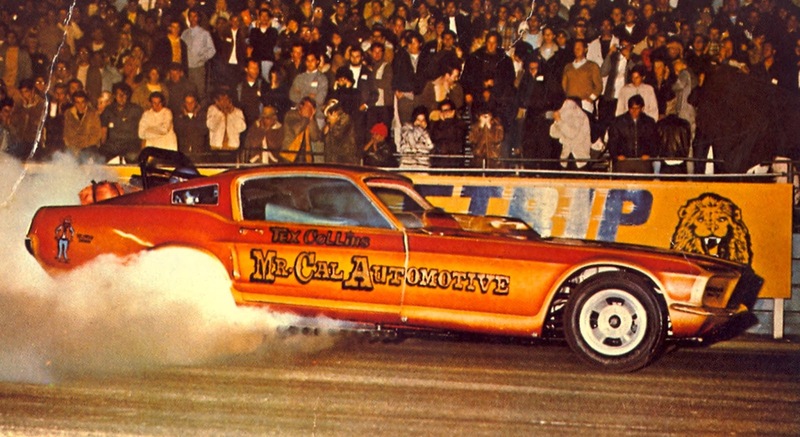 INTRODUCING This worlds nost powerful Mustang Mr. Cal Automotive, Driven by TEX COLLINGS the famous Hollywood badman. Powered by the World War II P38 and P51 Mustang - 12 Cylindrs, 1710 Cubic inch, 3500 H.P. Allison, Tex Collins, the only man that ever successfully made a Aircraft engine run in a car. No problem to go 200 MPH in 1/4 mile." Hey there may be a real story here! 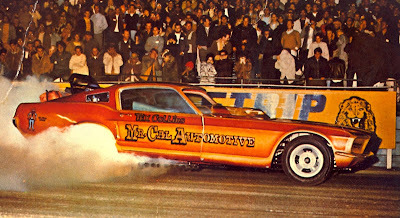 The hot rod shop called Cal Automotive Inc. in North Hollywood was bought out by a Hollywood stunt man named Tex Collins. Several internet accounts have it that Tex died as a result of being shot to death over equipment sold to a Texas client. "Curt Hamilton who founded Cal Automotive has a shop in Van Nuys, California on Stagg Street called Hamilton Automotive Industries. He still has the T-Bucket molds with the improved dash panel and molded one piece pick up bed body. All his bodies were hand lamenated fiberglass., cleaner and stronger than a messy chopper sprayed body. Tex Collins, who purchased Cal Automotive from Curt tried to mass produce T-Bucket bodies by selling franchiases with hastley made molds to "Mom and Pop" operations. One such operation soured and as a result Tex was shot in the back by the son of a law enforcement official and was later aquitted at trial. Tex was a part time Hollwood Western stuntman who had a fiberglass company called Ford Duplicators in North Hollywood when he purchased Cal Automotive." Glad you spoke up to make the story right! I remember your dad's place on Lankershim. As kids, we would press our snotty noses against the glass to look at the cool cars. And in my teens in the late '60s, I worked at the McDonalds across the street. Great memories. Sorry I never heard about his passing until recently. You mean the ones that Dean made all the molds curt lifted from calautomotive after tex died from the low life Earl he left outside for forty years that i saw with my own eyes sorry but in 1965 tex had a deal with shelby it was not a con. he needed bigger shop and more employees to get it done on t bucket plans.com its stated by curt that he sold calautomotive in late 67 but was not the way it was tex was writing the checks in 1965 not 1967 no chopper gun .intel 1971 by the way i still have some of the bodys with tex collins business cards in them not made with a chopper gun get it right. My dad's cabinet shop was next door to Cal Automotive on Lankershim in the early 70's---It was called Crown Cultured Marble because he was also making cultured marble countertops to go with the bathroom cabinets we made. I used to play around and sit in the "Quad AL", the beast with the 4 Allison Aircraft engines. It was all dusty but displayed in the front showroom. I was too young to know how well my dad knew Tex. But my dad was into neat cars too, he had Dean Moon ("Moon Eyes"), put a 427 into his 1956 Lincoln Continental Mark 2. (I remember doing 140 MPH in that car on the 5 freeway on the way to church one morning...dad was a nut job.) He also drove a cool dark blue 1961 Rolls-Royce Silver Cloud 2. Dad moved to bigger building in Pacoima in 1974--Do you know if Famous Earle is still around? (Earle Rogne).